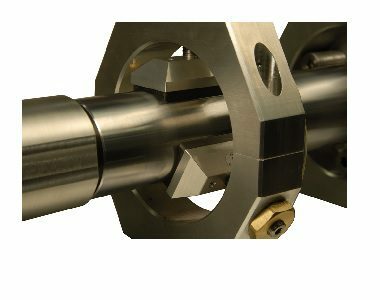 We combine our radial air bearings, which utilize Porous Media TechnologyTM, with adaptive hardware to eliminate damage to the rotor from contact with hard rollers and the mess of oil film bearings in vacuum chambers. Most importantly the air bearings provide a more precise axis of rotation with a cleaner signal for high-resolution balancing. Mechanical, electrical, and audible noise in balancing operations is reduced by supporting the rotor on air bearings in both hard and soft balancing machines. 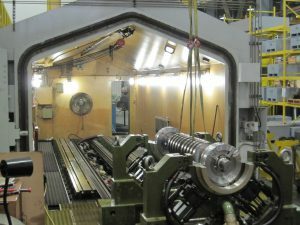 When a rotor is supported in rotation by hard rollers, any error motion in the rollers can mask out the balance forces resulting in unreliable balance measurements. For instance, combined errors from run out of the four supporting rollers cause asynchronous motion errors of the balancing rotor that often exceeds .001 of an inch. Alternatively, with the rotor supported on air bearings, the roundness of the journal (often .0001 of an inch or better) is the only rotating reference surface so the errors in motion will be synchronous and averaged to less than one-tenth of the amplitude of the hard rollers’ motion errors. This results in a clean signal that is exactly the same each revolution, allowing for a finer resolution in balancing. A rotor supported on rollers will also see some axial forces from misalignments of those rollers. Changes in this axial force, say from changes in unbalance force, are likely to be almost synchronous, but out of phase enough to obscure balance resolution. Air bearings impart zero axial force on the rotor, avoiding this error source. The radial friction is also near zero so the heavy spot finds the low point of rotation when the air pressure is supplied to the air bearings. This improves the resolution in static balancing by an order of magnitude because the static breakaway coefficient of friction is 10 times lower than that of rolling elements for a typical roller stand or horizontal-way static balancing set-up. New Way provides “bolt-on” adaptive hardware for integrating air bearings into existing low-speed balance machines. The adaptive hardware uses the same mounting features as the original hard rollers so is easily accommodated into your current system. We can also design the bearing pads to “snap on/snap off” to further simplify adding our air bearings to your balance machine. This feature allows easy swapping of various sizes of bearing pads so the balance machine operator can balance rotors without having to adjust or plumb air into the bearings. 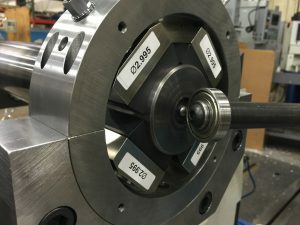 An additional and very practical benefit of replacing the hard rollers with air bearings is that the rotor can be supported on its bearing journals without fear of damage to the bearing surface from point contact with a hard roller or from contamination between the rolling surfaces at high speeds. 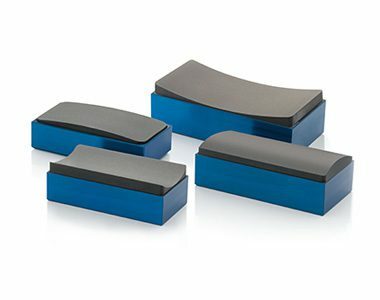 Balance bearing faces are often made from graphite which presents a large, soft contact area along with a non-scoring bearing surface should contact occur. In high speed or “at speed” balancing, the stiffness, and damping function of the support bearings becomes critical for good balancing. This is why large rotors are often balanced on operational hydrodynamic oil bearings even though these oil bearings can make a mess of the rotor in vacuum or cleanroom environments. This is especially an issue for motors and generators with electrical windings, but oil is still a mess for any bladed roller. Air bearings eliminate the need to flood, contain, and collect oil in a vacuum, and use so little air that vacuum pressure in the bunker is not affected. If you’re interested in switching to air bearings for your rotor balancing applications, reach out to New Way today to learn more.